^ 1.0 1.1 Yuri Dublyansky, Gina E. Moseley, Yuri Lyakhnitsky, Hai Cheng, Lawrence R. Edwards, Denis Scholz, Gabriella Koltai & Christoph Spötl. Late Palaeolithic cave art and permafrost in the Southern Ural. Scientific Reports. 2018. doi:10.1038/s41598-018-30049-w.
^ 2.0 2.1 2.2 2.3 Alexey Solodeynikov. Cataloging of Kapova Cave rock art. Symposium « Art pléistocène en Europe ». N° spécial de Préhistoire (PDF). L'art pléistocène dans le monde / Pleistocene art of the world / Arte pleistoceno en el mundo, Actes du Congrès IFRAO, Tarascon-sur-Ariège (Art et Sociétés, Bulletin de la Société Préhistorique Ariège-Pyrénées). 2012: CD529-538. ^ 3.0 3.1 3.2 Rock Painting of Shulgan-Tash Cave. UNESCO. [2018-11-05]. （原始内容存档于2018-07-30）. ^ Lomonosov Moscow State University. Scientists discover an Upper Paleolithic cave painting of a camel in the Ural Mountains. phys.org. 2017-11-28 [2018-11-05]. （原始内容存档于2018-03-18）. ^ Varvara Baskova and Vladislav Zhitenev. 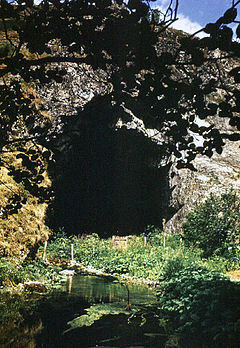 Diversity of cultural traditions in Kapova Cave (the Southern Urals, Russia). 2018. ^ Yury S Lyakhnitsky. Conservation of paleolithic cave art in the Capova cave (PDF) 3 (1). Journal of Historical Archaeology & Anthropological Sciences. 2018.